There’s something we need to be clear about from the start. 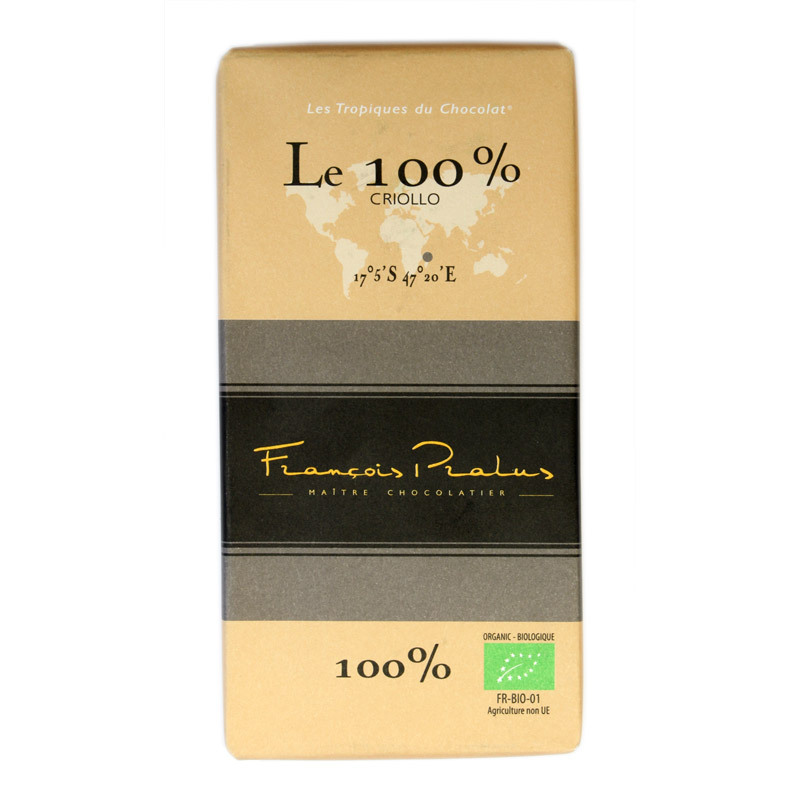 This bar from French chocolate maker Pralus contains no sugar at all. It’s not the kind of chocolate you take a big bite out of! As the “Le 100%” name implies, this is a 100% cocoa solids chocolate, containing nothing but cocoa mass and a little extra cocoa butter. But we think it’s a great way to show off the natural intensity and flavours present in cocoa. Break off a small piece, let it melt and discover the smooth texture and fruity, roasted flavour notes of Madagascan cocoa. Very lovely on the nose, and melts slowly on the tongue giving out lovely earthy notes. Not the best 100% out there, but not the worst either, and quite easy to consume for a 100%. This chocolate tastes fantastic, it really feels like 100%! Customer service is really good, 10/10 would buy again from these sellers, thanks! Out of all 100% I tried over the years this one is the best. I've been trying a few 100% chocolate bars and this is one of the milder ones I have tried. Very creamy, with a slight citrus on the palate and a mild (enjoyable) coffee aftertaste. 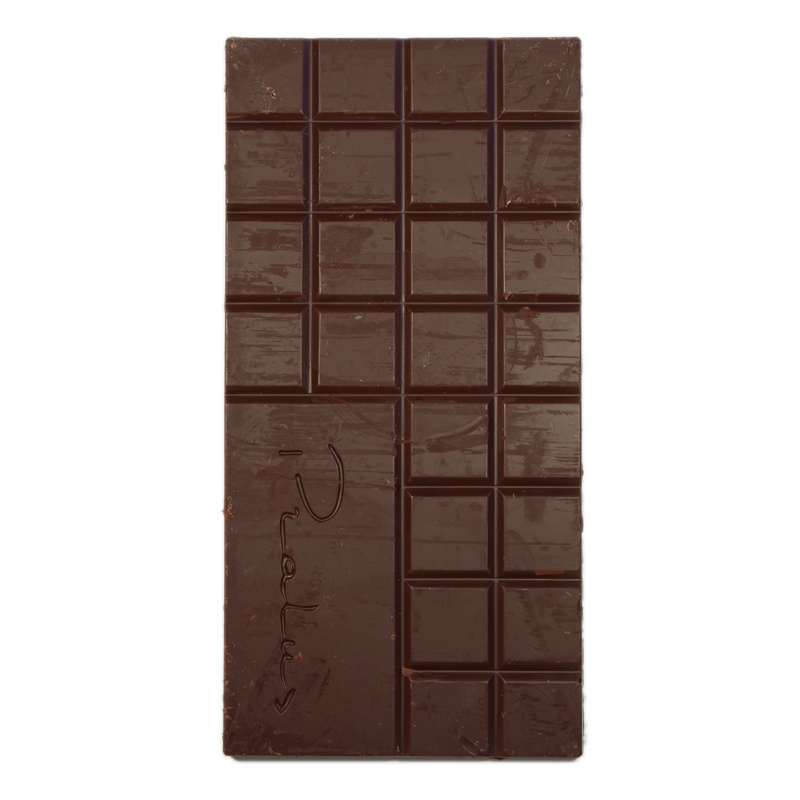 Perhaps my palate is changing, but unlike some of the other reviewers, I find I can eat more than a square of it and find it enjoyable and I can bite into it rather than just let it melt (some other 100% chocolates were quite chalky and not so nice to chew). I'll most likely buy this one again. There seems to be some variation between different batches of this chocolate. Knowing it before I expected it to have a heavier and deeper taste, however, the batch I received from Cocoa Runners proved to be much lighter and almost raisiny. And I liked it a lot! With such a taste that would be my no 1 bar among 100% bars I have tried so far! I only like dark chocolate but I didn't like this one. No sweetness at all, very bitter. I hope we don't get sent any more 100% cocoa bars in our monthly packs. Absolutely wonderful - one for the dark (or in this case, pure) chocolate connoisseurs! Interesting, and much more palatable than another 100% bar I tried once, but not hugely enjoyable beyond the initial intrigue. It will take months to get through such a big bar, considering how little of it you would want to eat at any time (max. 1 square). Personally, I would much rather receive bars that aren't such hard work to enjoy. Initial taste of soft mint, then fruity tastes and an intense chocolate flavour, with a roast lemony hint. Acidic but not that unpleasant bitterness I expected, more of a citrussy tone. Certainly a very interesting chocolate bar! Definitely to be taken in small nibbles but this grows on me with each square I eat: wonderfully smooth and creamy on the tongue, fabulous aromas that linger on the taste buds and in the nose long after the chocolate has melted. Mysteriously, it manages not to taste savoury despite the absence of sugar - just intensely, almost shockingly, chocolatey. Wow. Read the letter that comes with this month's box. They aren't kidding when they say half a square. And for $deity's sake don't chew it! Let it melt across your tongue. This is chocolate for people without any sweet tooth at all. The first flavour you get is creamy sweetness, followed by a really strong bitter mocha/coffee flavour almost overwhelming (I was once dared to eat a teaspoon full of instant coffee, and this has a similar intensity). Then finally a deep savoury and almost meaty (Umami?) characteristic, and finally creamy again. Surprisingly I expected this to have that acerbic mouth drying feeling that most high cocoa dark chocolates have. But it doesn't. Try a little of this instead of that morning espresso. It will certainly wake you up. for a 100% chocolate, I noted some sweetness to it. I had just one square of it from my gift package, so this is a limited note - but I like it! The rich smooth lump snapped nicely, and the bitterness was dry but pleasant. For a no-sugar bar this is an adult pleasure, albeit one that is hard to find. Not everyday choc, I like this an alternative treat.